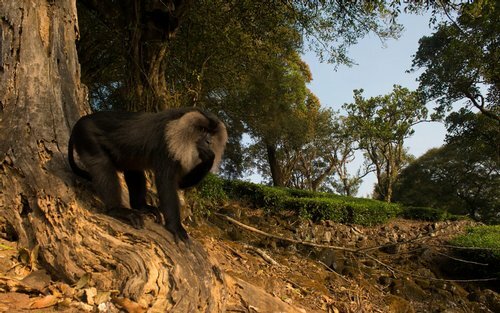 Lion-tailed macaques are a species of monkeys endemic to the Indian western ghats. Classified as Endangered by IUCN, these macaques are canopy dwellers and can be seen moving amidst the rain forests from one canopy to another. These images were made at Valparai in Tamil Nadu where there is a healthy population of these macaques. According to the local naturalist there are three groups. The group that I photographed consisted of approximately 30-35 individuals. While tracking and spending substantial time with them daily I noticed a certain pattern in their behaviour. They would approach from one end of the forest and then climb down the trees, walk amidst the tea garden and enter another part of the forest. The behaviour was probably a result of the tea estates cutting into the forest resulting in loss of canopy cover. Using the knowledge of their this behaviour, I setup my camera on a tripod and a remote shutter under a large tree which was located amidst the tea estate. After setting up the camera, we hid behind a bush while observing the macaques. One particular macaque got close to the camera while nibbling at the bark on the ground. In several portions of western ghats these monkeys are known to cross on foot due to loss of canopy cover. Walking on the ground exposes the macaques to human beings, feral dogs and at times speeding vehicles. Several incidents of macaques being run over by vehicles have been reported from Valparai. Owing to frequent deaths, a NGO setup few bridges across the road. 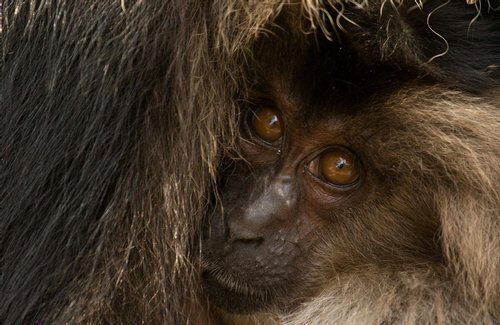 However, large tracts of canopy-less land still remain forcing the macaques to travel by foot.